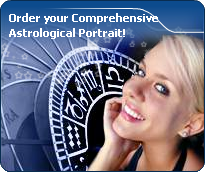 You will find below the horoscope of Sabrina Sabrok with her interactive chart, an excerpt of her astrological portrait and her planetary dominants. If you know the time of birth of Sabrina Sabrok, we would appreciate it if you would send us your information with your source, at stars@astrotheme.com. To thank you for contributing to the enhancement of our astrological database, we shall be glad to send you the astrological portrait (34 pages) of this celebrity. Horoscopes having the same aspect Mars sextile Neptune (orb 1°50'): Justin Timberlake, Sophie Marceau, Warren Buffett, George Michael, Chris Martin, Laeticia Hallyday, Jeff Buckley, Muammar al-Gaddafi, Brooke Shields, Melanie Griffith, Mark Ruffalo, Elijah Wood... Find all the celebrities having this aspect. Horoscopes having the same aspect Sun square Neptune (orb 2°10'): Lady Gaga, Paul McCartney, Julien Courbet, Carl Jung, Ellen DeGeneres, Caroline, Princess of Hanover, Edward Norton, Angela Merkel, Hilary Duff, Frédéric Chopin, Marie Antoinette, Kevin Costner... Find all the celebrities having this aspect. Celebrities born the same day: François Fillon, Miriam Makeba, Laurence Chirac, Antonio Vivaldi, Brooklyn Beckham, Bobbi Kristina Brown, Chaz Bono, Ronn Moss, Jazmin Grace Grimaldi, K. Michelle, Patsy Kensit, Nicole Calfan... List of all the celebrities born on March 4. Celebrities clicked on in real-time: 577,212,594 times. Sabrina Sabrok was born in Buenos Aires, Argentina to Hugo and Martha Sabrok. Sabrok was the second oldest child in a family of four children. In the mid-1990's, Sabrok moved to Mexico to pursue a career in television and modeling. In 1996, Sabrok began modeling in advertisements for companies such as Bic, Sanyo, Harley Davidson, Diesel Jeans and Volkswagen. The same year, Sabrok formed the First Impressions rock band. In 1997, she and the rock band were support band when Marilyn Manson visited Argentina. Sabrina and the band released five albums. She has appeared in various television shows such as La hora pico (as a model), and the Mexican edition of the reality show Big Brother VIP. Here are some character traits from Sabrina Sabrok's birth chart. This description is far from being comprehensive but it can shed light on his/her personality, which is still interesting for professional astrologers or astrology lovers. In a matter of minutes, you can get at your email address your astrological portrait (approximately 32 pages), a much more comprehensive report than this portrait of Sabrina Sabrok. Warning: when the birth time is unknown, which is the case for Sabrina Sabrok, a few paragraphs become irrelevant; distributions in hemispheres and quadrants are meaningless, so are dominant houses and houses' accentuations. Therefore, some chapters are removed from this part. Sabrina Sabrok, Fire is dominant in your natal chart and endows you with intuition, energy, courage, self-confidence, and enthusiasm! You are inclined to be passionate, you assert your willpower, you move forward, and come hell or high water, you achieve your dreams and your goals. The relative weakness of this element is the difficulty to step back or a kind of boldness that may prompt you to do foolish things. The predominance of Water signs indicates high sensitivity and elevation through feelings, Sabrina Sabrok. Your heart and your emotions are your driving forces, and you can't do anything on Earth if you don't feel a strong affective charge (as a matter of fact, the word "feeling" is essential in your psychology). You need to love in order to understand, and to feel in order to take action, to the detriment of a certain vulnerability against which you should learn to fight. Earth qualities are under-represented in your chart, with only 6.79% instead of the average 25%. Deficiency in Earth may indicate that you have no interest in material and concrete values. It is likely that you live too much in your heart or in your mind, or even in your enthusiasm! The fact remains that you may end up in tricky situations, due to your lack of good sense or forethought: material life is unavoidable even if you are rather idealistic, dreamy, or easily content. You must tackle concrete life necessities, for fear of... being forced to cope with them, later, in much more unpleasant ways! The three most important planets in your chart are Uranus, Pluto and Saturn. After this paragraph about dominant planets, of Sabrina Sabrok, here are the character traits that you must read more carefully than the previous texts since they are very specific: the texts about dominant planets only give background information about the personality and remain quite general: they emphasize or, on the contrary, mitigate different particularities or facets of a personality. A human being is a complex whole and only bodies of texts can attempt to successfully figure out all the finer points. Love at first sight, flash in the pan, amorous impulsiveness? All these are part of your way of loving or to fall in love, Sabrina Sabrok. Throughout your relationship, you maintain this kind of jerky and lively style, that may seem childish or naïve, but that is so generous and cheerful! You are undeniably possessive and you are not concerned with your partner's opinion but, fortunately, you readily forgive because of your spontaneity and your authenticity. When your relationship is intense, everything is fine. There is no romanticism, no complications with you. You love with ardour and, except for a few crazes and opportunities for new pastures here and there, the only danger may be that boredom settles in. In that case, you leave without regret and you quickly forget what consumed you, not so long ago. Sabrina Sabrok, the way you take action is quite paradoxical: you carry out your business perfectly well when you are in a teamwork with collective goals, but you do so in your original and individualistic manner: this is your main peculiarity. Your concern is to express your originality and your specificity while remaining immersed in a human community. You are curt and not very flexible. You are inventive and you easily fight authority, just because its very principle runs counter to the sacred values of freedom, independence and, above all, the absence of constraint. Competition does not appeal to you. You prefer to be useful and to conquer new territories of the humanitarian or the intellectual type. On the sexual plane, you are also often original and surprising regarding your fantasies and your tastes. This text is only an excerpt from of Sabrina Sabrok's portrait. We hope that it will arouse your curiosity, and that it will prompt you to deepen your knowledge of astrology, as well as to visit and use the wide range of free applications at www.astrotheme.com. Your Life Path is influenced by the number 4, Sabrina, and your destiny implies sustained efforts, long-drawn-out works, and concrete achievements. The path may seem a bit tedious, but it is very promising, provided that you demonstrate some tenacity, loyalty, and patience. You are often invited to display orderly and methodical qualities, and step-by-step, you go through all the stages which may lead you to success, if you do not let hurdles dishearten you throughout your life. Persistence is among your major qualities. You see life as a challenge, and, far from falling into the trap of picking the easy way out, you face problems with calm and lucidity, and you choose the work and steady effort which open the door to success, although evolution requires quite a long time. Your personal path is based on continuous efforts and on maintaining the same immutable direction.